Games have been part of Google+ for a while. They were not a launch feature but Google understands how important social gaming is and was quick to introduce them to their must-succeed platform. It's also been the case that Google has been happy to promote individual games too. Games have traditionally lived in the sidebar to the left and Google+ would know to remind you of those games you've already looked at or even tried. 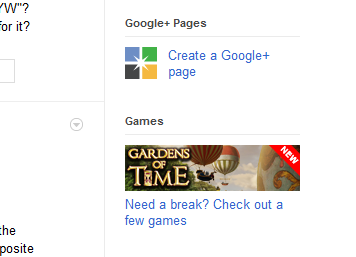 File this as "new to me" but the most recent games promotion on Google+ is different. We're talking about banner promotions here and left to speculate how games score this prime slice of real estate. Does Google get paid for this? Is this an editorial choice? The new game promotion lives in the sidebar to the right. That's the same column that Google typically reserves for calls to action - such as Circle suggestions and prompts to send Google+ invitations to your friends.